Bible Belt Balabusta offers a convenient way to craft a menorah to take with you, wherever you go! 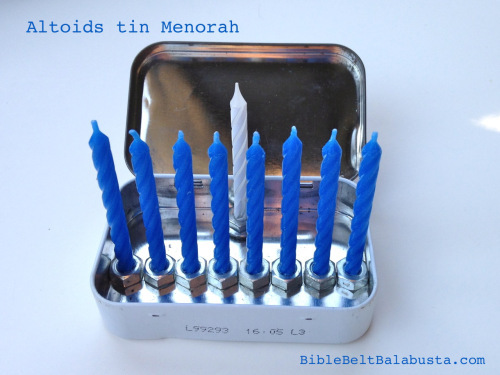 "Nine hexnuts glued inside an empty Altoids tin = Travel Menorah. Or, a Curiously Tiny Menorah. You can’t get much easier. Or smaller for that matter. Mine is the classic Altoids size, and it holds—just barely—a row of birthday candles with the Shammash nearby."